What are the areas that support which teams? Here's the boundaries of fandom in the 50 states on this map. If clicking on it doesn't work, then go to the Facebook link. The Yankees have a fan base in Virginia, North Carolina, and Louisiana. The Giants are big in Northern California. The Cardinals' territory extends into Arkansas and west Tennessee. The Tigers' fans are about exclusively in Michigan, and the Brewers' fans are all in Wisconsin. New England is solidly behind the Red Sox. The Mariners' area is Washington, part of Oregon and Alaska, and the northern part of Idaho. The South is solidly behind the Braves. For some reason, Alabama leads the nation in per capita money spent at the Ashley Madison extramarital affair dating site. Are many preachers and politicians involved? As this article explains, we have a problem meeting budgetary demands in Alabama. Basically, there are three sides: Raise taxes to meet the shortfall, lower taxes, or support gambling or a lottery. Here's the three sides, presenting their arguments in the form of a rap. Maybe we should hold a state funding bake sale instead. How about the lovely Mylene Demongeot, French star from the 1960's? 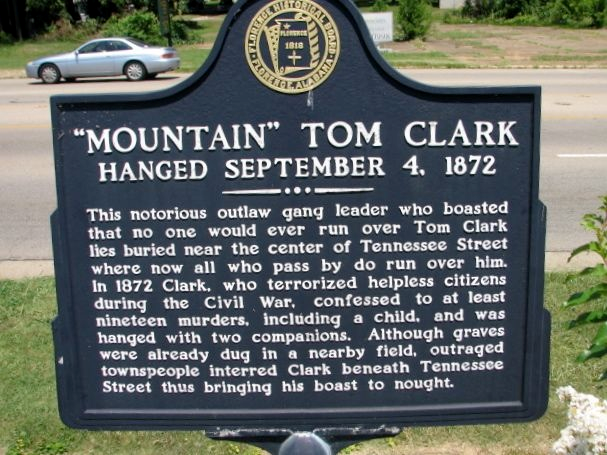 Florence, Alabama has an interesting sign to memorialize a lynching of a notorious outlaw hanged in 1872, and buried in the middle of Tennessee Street. Mountain Tom Clark, subject of much legend and historical fact was the person in question. After the Civil War there was a lot of lawlessness and paying back of old scores, some not even war-related. Hopefully, this link will provide some background; perhaps more than you might want to plow through.